At the risk of this post becoming immediately outdated if the upcoming 2017 Fall Edition turns out to be a green edition, I present you some pictures of green Field Notes! 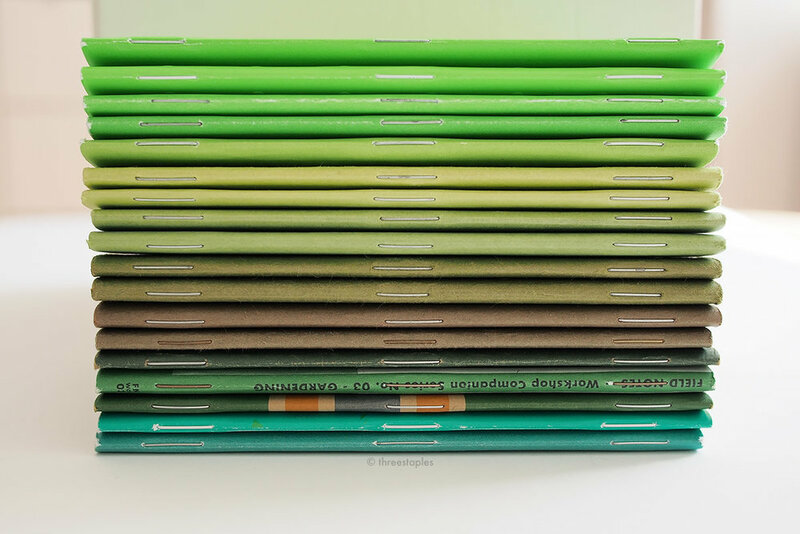 There have been many green Quarterly Editions so far, and in this post I'm focusing on a broader range of the color, including some non-solid covers that are predominantly green. About half of these are Quarterly Editions; the non-COLORS editions are italicized in the list above. Hmm, looks like green is quite a common color choice, huh? And it’s good to see them spread out among all four seasons. The above covers are all matte in texture, except Starbucks Capitol Hill, Starbucks Coffee Origins, and Unexposed. These feature Sappi McCoy 100#C White as the cover stock, and have that slightly glossy, soft-touch feel. Capitol Hill is unique in that it is embossed all over with a polka dot pattern. Ambition is also embossed but only the logotype is. Grass Stain Green is letter-pressed on the other hand, and Balsam Fir and Day Game are foil-stamped in white. All are bound by silver-colored staples, except Starbucks Capitol Hill and Starbucks Coffee Origins (white staples), Ambition (gold-colored), and Workshop Companion (brass). As you can see above, Ambition is the only one with gilded pages. I won’t get too deep into comparing what’s inside these memo books, but Ambition is also the only one here with the ledger format. Also, not all are graph-grid. Unexposed and Capitol Hill are reticle-graph grid, and Our503 and DDC have blank pages. Day Game, Workshop Companion, and Starbucks Coffee Origins are dot grid. 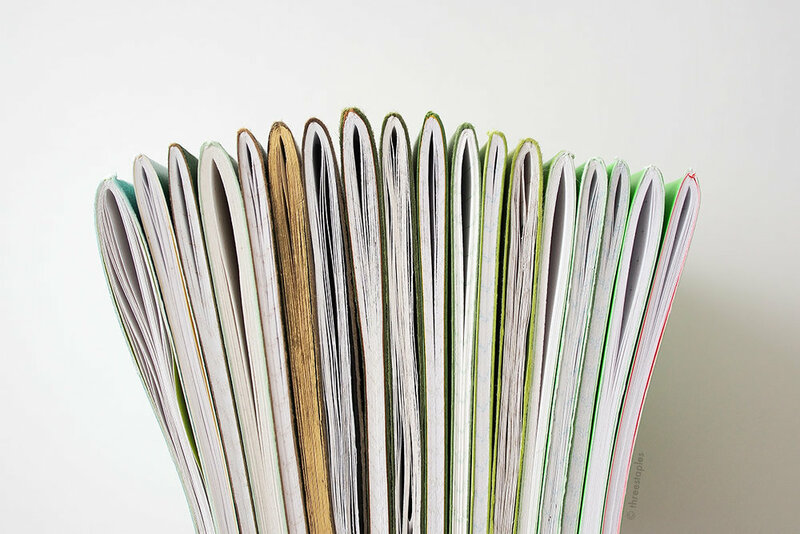 Balsam Fir and Ambition both use French Paper Speckletone in “Olive” as their cover. National Crop and Flagged by Ellen use French Paper Pop-Tone in “Sour Apple”. Grass Stain Green and Shenandoah “Sweet Birch” feature French Paper Pop-Tone in “Gumdrop Green” (again, just on the outside of Shenandoah’s custom-duplex cover). Shenandoah “Sweet Birch” & Grass Stain Green on the left, Day Game & Shenandoah “Chestnut Oak” in the middle. Both Flag Nor Fail and The Field Museum use French Paper Pop-Tone 100#C “Gumdrop Green” – same as Grass Stain Green and Shenandoah “Sweet Birch”. Popular green paper of choice, apparently! It’s not hard to see why, though; it’s a lovely, textured, medium green. Webstock 2013 also looks like the same “Gumdrop Green” but I can’t be sure. 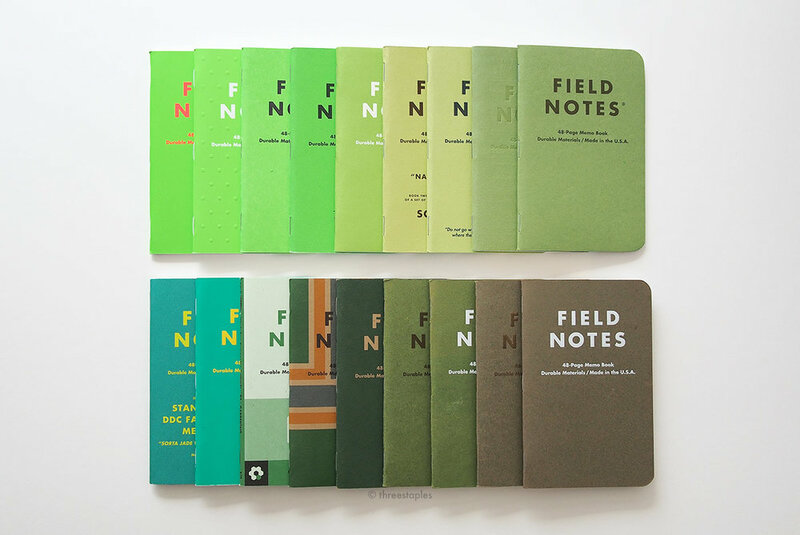 If you can verify this or know of other “green” Field Notes editions, do leave a comment! 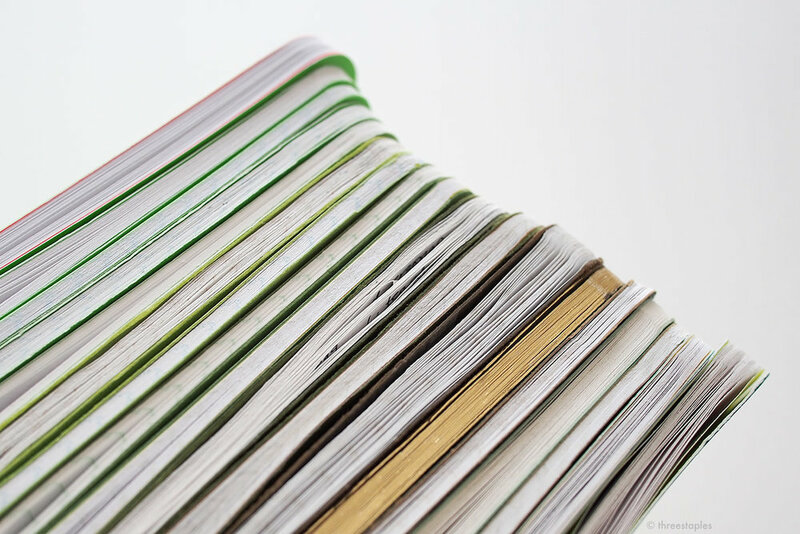 What are your thoughts on green Field Notes so far? Want to see more, or have we had enough? Personally, I’d love to see French Paper Pop-Tone “Limeade” someday or shades of dark green some more, preferably in linen-texture. One can only hope. The sale of each 3-pack of Two Rivers benefits the Hamilton museum, located in Two Rivers, Wisconsin, with Field Notes donating $2 per pack. (You can also make donations separately, when you are checking out from the Field Notes website. When you do, you get a nice Thank You note). If you’re into letterpress printing, you probably have heard of the museum before and their efforts to preserve the American design and printing history. I won’t go into too many details; their website and the Field Notes edition page can explain much better the museum’s mission and what they offer. Also, I claim this as a required reading for any Field Notes fans! Go read the museum director Jim Moran’s post on how the collaboration came to be (the idea going way back to 2011!) and his printing journey. Loads of behind-the-scenes pictures give us valuable insight and appreciation for these little memo books, too. Be sure to watch him and Aaron Draplin talking about the edition here, as well. Team effort. How cool is that the code name for the project was “The Portland Project”? Familiar faces from the Field Notes crew! (screencap from the official Two Rivers video). 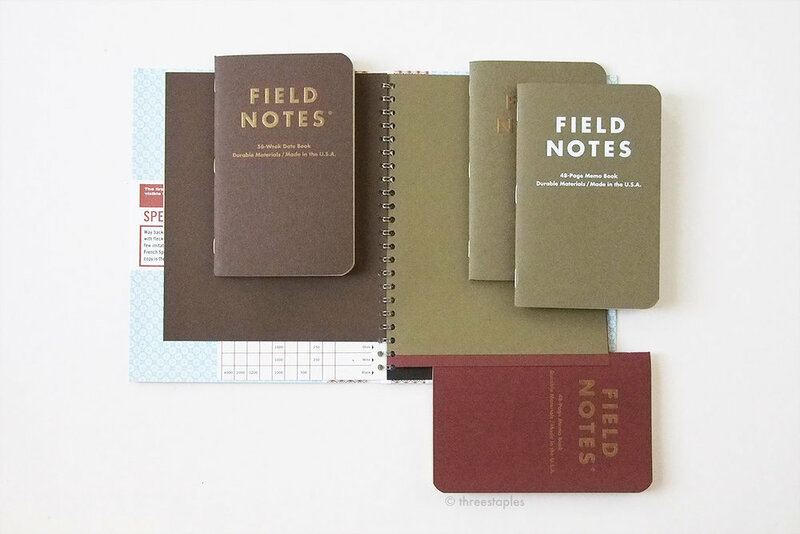 Two Rivers is easily the most handmade edition among the recent Field Notes Colors. Each cover features 2 different designs, out of 7 designs that were hand-set by Aaron Draplin, Bryan Bedell, and Matthew Jorgensen of Field Notes. The covers are actually hand-printed by the Hamilton Museum director himself with the help of the Assistant Director, Stephanie Carpenter. Their old printer had to be nursed back to life with the help of experts and constantly maintained, and even with printing through nights and weekends, volunteers and interns had to pitch in. Sounds like this was an all-hands-on-deck sort of project, doesn’t it? With many people’s efforts and time that had to be put in, it’s no wonder the edition size is slightly smaller this time, at 25,000 packs (Ambition, the previous edition, was 30,000 packs). Still, that’s no small amount, and I hear Two Rivers almost became a summer edition instead of a spring edition, because of the time involved. Perhaps this is why we haven’t seen a hand-printed Colors edition in a while. (The last one was Fire Spotter, back in Fall 2011, with only 12,000 books). It must be getting too expensive and time-consuming, as Field Notes continues to grow and edition sizes get bigger. I love letterpress and its tactile quality, so I’m glad Field Notes didn’t abandon the idea. When I finally got to hold Two Rivers in my hands, I was instantly impressed. I’m enjoying all the little details that come with hand-printing, including variations in the texture and the extra ink smudges on the inside covers. Not to mention, the ink smell! It has mostly faded by now but it was still a nice reminder of how they were made. Hopefully this is not the last time we see letterpress. Another screencap from the official Field Notes Two Rivers video. Word. Four different cover colors, from top: Packing Brown Wrap, Sno-Cone, True White, Lemon Drop. Copper staples of Two Rivers (front) and silver staples of Original (back). The yellow cover in Two Rivers (Pop-Tone in “Lemon Drop”) was used previously in Packet of Sunshine (Spring 2010) and National Crop’s “Corn” (Spring 2012). The light blue cover (Pop-Tone in “Sno Cone”) was used in Just Below Zero (Winter 2009/2010). The kraft cover (Dur-O-Tone in “Packing Brown Wrap”) is used in the Original 3-packs of the permanent line, of course. In the Colors series, it was previously used in Day Game (Summer 2012), and Dry Transfer (Spring 2011). National Crop (far left) and Packet of Sunshine mixed in. Belly band in matching dark blue and look who’s featured on the back! The more impressive “first” regarding the cover paper is that they were donated by French Paper Co., in Niles, Michigan. There’s a nice and short video with Brian French talking about his company’s contribution to the cause. You can even spot their logo on the back side of the belly band; I think it’s their first appearance there! With the “forces from the Great Lakes coming together,” as Aaron Draplin put it, it’s fitting that the usual space for the “Practical Applications” on the back inside cover made way for a special paragraph on the Museum and the collaboration. The Specifications are longer and more descriptive, too. It’s not the first time “Practical Applications” are missing though. Neither Night Sky nor Arts & Sciences has them. Just look at that glorious J, look at it!!! But the most obvious “firsts” in Two Rivers, besides the donation aspect, are the randomness of the covers, which I’ll get into below, and the fact that the covers are letterpressed with wood type designs. We’ve seen non-solid designs before (America the Beautiful), but this is the first time in Colors that we see big, bold type designs on the covers. And earlier editions like Grass Stain Green, Raven’s Wing, and Fire Spotter were letterpressed by hand but I am pretty positive they didn’t use wood type. And the indents on them were deep, purposeful, and precise, whereas in Two Rivers, you see a range of depths in the impression of the (mostly) wood types. In some areas, you can feel the outlines of the design, where the wood pieces were pressed, and in some areas you can barely feel it. (Based on what I’ve learned, in the old days of letterpress, the purpose was to transfer the ink just barely, without making any indents). I love it either way. I’ll take whatever hand-printed Field Notes any day. That's unmistakable wood grain showing through right there. Mm! Each pack of Two Rivers contains 3 random covers out of thousands of variations. Unexposed had a bit of the random factor, too, but that edition had only 6 variations. This edition? You do the math because I won’t: 7 different designs printed on 4 different colors of cover stock, with 3 different ink colors. Oh, but wait: each cover sheet was printed with 2 of those 7 designs in 2 different colors of ink, and then cut in half to make two covers (“2-up”). And let’s not forget that the inconsistent nature of the wood type, letterpress printing, and the inking. All in all, we’re told thousands of variations were produced. According to the museum director, Bryan Bedell “wanted as many variations as possible.” Okay! As a Field Notes collector, it might be upsetting but I’m not bothered by it (but then again, I never considered myself a hard-core collector). I knew I would never be able to “complete,” and this edition made it much easier for me to be at peace with that. I’m actually enjoying the randomness too much to be bothered by it. Every time I opened a new pack, which I couldn’t resist doing, I had a new favorite. My favorites are definitely the ones with less “busy” designs with more harmonious color combinations. Many of my least favorites are the kraft ones with red and blue inks; they are too “camo” for me. This is why Two Rivers, as an edition, not individual notebooks, will never place in the top 10 of my Field Notes ranking. I love the concept behind it but considering strictly the random factor and the visuals, Two Rivers ranks somewhere in the middle for me. But that doesn’t mean I won’t be tempted if I come across Two Rivers at a local store. If I see a variation I like, I can’t promise to exercise self-control. Do you see the giant “BBQ!”? I could show you all the different design that can be pieced together but it’s probably more fun if you find out for yourself! Plus, I did not get all the different designs. That illustration of pig & cow and “farm” text? None of my Two Rivers has them (yet). My top favorites so far. The only kraft ones I like have big, bold designs. The only pair that I have that ended up with the same two designs layered. But notice how they are aligned differently. Variations not only on the outside covers. Notice the difference in the ink saturation. This where I usually add all the interesting specs found on the back inside cover, in a list format. Many of them are already mentioned so far but I will fill this section later, since this edition is still so new. Plus, I spent way too long on this post already. I might also add more opinions and insights later, after I spend more time with these notebooks. DDC! The wood type for the DDC logo looks nice and new in the video!